Moving students into the residence halls for the new school year can be hectic, but there are also some great opportunities to green the process! 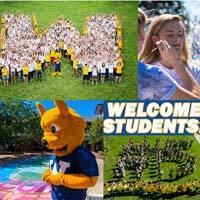 Webster University Sustainability and Groundskeeping are offering several additional services this year to help make the Move In (Thursday, Aug. 18, and Friday, Aug. 19) experience more environmentally-friendly. Blue rolling recycling bins will be placed in the lobbies of the residence halls to collect both unwanted donation items and electronic waste during Move In. Clearly labeled recycling and landfill dumpsters will also be available throughout the parking lots of the residence halls. Volunteers will be available on a limited basis throughout the day. Contact Kelsey Wingo, sustainability planner, at kelseywingo07@webster.edu for more information.